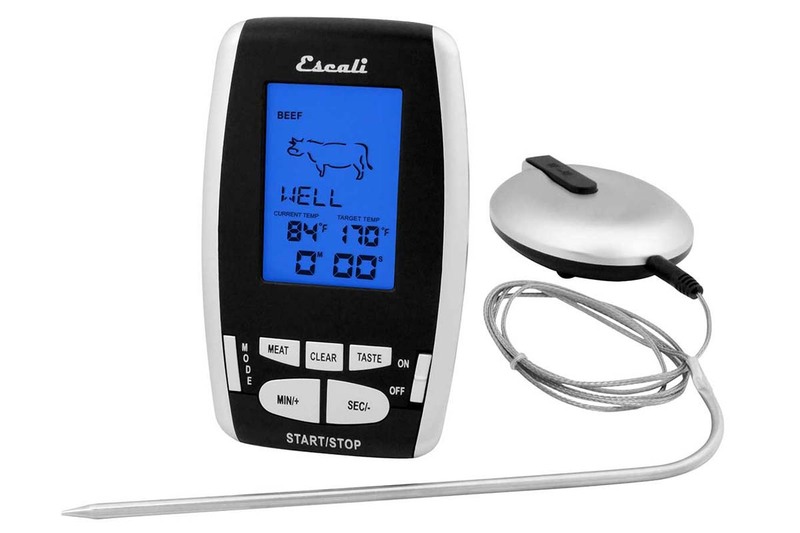 The Escali Wireless Remote Thermometer and Timer combines two crucial kitchen tools into one portable multifunction unit. Using the oven safe probe; grill the perfect prime rib with the preset target cooking alerts and multitask while on the move using the built in kitchen timer. Custom target temperature with alarm. 7.25 inch probe; Display: 4.75 x 2.875 x 1 inch. 40 inch oven safe cord. The wireless display unit easily slips into your pocket or clips onto your belt, so time and temperature measurements are always close at hand. Range 65 ft. Temperature alerts for varying levels of doneness are stored in the thermometer for beef, lamb, veal, hamburger, pork, turkey, chicken and fish. The stainless steel probe and cord are specially designed to withstand the high temperatures found in an oven or grill and may be left in food while it cooks. Count up or down to a maximum of 99 minutes : 59 seconds. The extra large display is easy to read under any lighting condition and turns off automatically after 5 seconds of inactivity to save battery. Use the display unit’s belt clip to keep it with you at all times, or place it on a countertop using the built-in kickstand.